Due to Hurricane Michael, Centennial Bank was destroyed. Please continue to check back as updates will be made with regard to their next steps. Due to Hurricane Michael, PeoplesSouth Bank was destroyed. Please continue to check back as updates will be made with regard to their next steps. ‘The Bank You Can Call Your Own’. Our commitment is to offer our customers top-quality banking needs and to provide the highest possible level of customer service. Captain Alan Sligh invites you and your family to enjoy personal service on the Sea Escape, a 24-ft. Carolina Skiff with convertible top. We offer: Fishing Trips-4 Hours (licenses and bait and tackle provided). Shell Trips to a beautiful and remote island ~ see Dolphins swim alongside on the boat trip over, and there are always lots of shells to find. Snorkel Trips to a 1852 Shipwreck, it is in shallow water and perfect for smaller children, all snorkel gear and instruction is provided. The City of Mexico Beach has a variety of boat slips available to meet your needs while vacationing in Mexico Beach. Slips are located adjacent to Canal Park on the Gulf Side of Canal Parkway. Contact the Harbormaster for availability and reservations. Contact the Harbormaster before docking in any spot on the canal. All vessels will be officially measured upon arrival. The length will be determined by measuring the furthest extension, bow to stern. Height and width will be measured as well on an as needed basis. Any special support or racks needed to moor a vessel shall be provided by the owner at owner’s expense and only with written permission of the Harbormaster. Charter fishing from Mexico Beach in the Gulf of Mexico and from Port St. Joe in St Joe Bay is some of the best on the Panhandle! From family fishing to serious anglers we will make your fishing charter a time to remember! We do offshore trolling and bottom fishing. Also near shore fishing, for redfish, trout and flounder. Let’s have fun! Let’s go fishing! Explore St. Vincent Island aboard a spacious boat with licensed Captain Joey Romanelli. The shuttle departs and returns daily at YOUR schedule from Indian Pass Road C-30B, Florida. Choose your mode of transportation. Enjoy a hike or we’ll transport you and your bike to the island. In addition to our shuttle, we offer pleasure cruises and charter fishing trips. Come explore a unique and natural island. Hike the trails or stroll the beaches. Shelling, surf fishing, and bird watching are some of the treasures you’ll discover at St. Vincent Island. Your local one stop telephone, internet, phone store and phone system provider. We pride ourselves in giving you the best, connected in home experience; delivering you services on one platform, from one company, and equipped with the latest technology so you get the most out of your TV, Internet & Phone. We are committed to bridging the digital divide between major cities and America’s smaller regions by providing the best technology available. Clementine’z Concierge Services LLC is a professional and reliable concierge service. We will do all of the grocery shopping for you as well as meal delivery service. We also offer cleaning services, home organization, house sitting, errand services, personal shopping, secretarial services and many other services that will make your stay and/or life in Mexico Beach an awesome experience. If you need a hand, please call or email for a free quote. We shop – You enjoy the world’s most beautiful beaches! Professional shopping and delivery service: stocked kitchens for vacationers, local restaurant meals delivered, fresh local seafood delivered. Beach chair & umbrella rentals. Let us help make your vacation perfect. No more packing and repacking the car to make everything fit or stuffing items around the kids to make room in the car for chairs. Let us do the daily set up and take down for you. No more packing and repacking the car to make everything fit. Staying more than one day? No problem, we will set up each day you will be on the beach and take down once your are done. Call today to reserve your beach chair and umbrella! Follow us on Facebook – click here. Specializing in residential construction, additions and custom homes. Please visit our website for more information and current image gallery. A commercial construction contracting firm founded on “old fashion” family values and hard work that has been the basis for our family’s successful business ventures for more than four generations. Come Break-A-Way with Capt. Bobby and Capt. Wade Guilford. We offer inshore, offshore, trolling, bottom fishing, dive trips, scalloping trips, and sightseeing trips. We also offer night time flounder and shark fishing trips. Our fleet includes a 26′ Scandy White, 25′ Mako, and a 20′ skiff. We offer half day trips (4 hour), full day (8 hour) or we can customize your trip to fit your needs, just give us a call. Contact Capt. Bobby-850.227.4159 or Capt. Wade- 850.340.1188. Experience Mexico Beach on the water with KC Sport Fishing. Offering 1/2 day and full day bottom fishing or long range trolling fishing charters. We also offer dive charters so you can dive, snorkel or spearfish the area reefs and wrecks. Want to sit back and relax? Enjoy a party and fun cruise, wildlife/sightseeing cruise or sunset cruise. Give Captain Kevin a call to schedule your trip for a great time on the water! Barefoot Kayaking is a locally owned and operated paddle board, kayak and bicycle rental company located in Mexico Beach, Florida. We deliver all the gear to your hotel or beach location. Whether you’re looking to paddle along with dolphins, enjoy the serenity of the gulf, seek adrenaline on the surf, or admire the view while biking, Barefoot Kayak & Paddle Board Rentals will provide you with all the gear you need for your adventure on or along the Gulf. 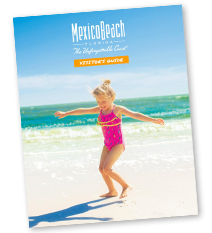 Experience Mexico Beach from a board, kayak or bike this vacation and take home a great story! Explore the incredible areas unique to the forgotten coast. We offer fully outfitted and guided custom tailored kayak trips, kayak eco-adventures, and pontoon boat excursions by a Coast Guard licensed captain. Book your adventure today! Capt. Butch Alley is U.S. Coast Guard certified and offers fishing trips that include bait, tackle and license. Come enjoy a fun day fishing with friends and/or family! Have a big time on the Big Time! Business, family, pleasure, or competitive fishing … we’ll do it all and have fun at the same time! Charters out of Mexico Beach canal behind Blue Water Inn. A trip with Charisma Charters can be a business situation, a family outing, or a real fisherman’s chance to catch that big one. Trips for four or eight hours are inshore trolling for kings, Spanish, blues, blue dolphin, little tuna, ling (or cobia), and some light tackle fishing on our man-made reefs or sunken boats. Off-shore fishing is 12 hours for grouper and snapper. Longer trips are also available. All fishing licenses, tackle and equipment are furnished. You bring only your food and drink. Charisma Charters can provide you and your family and friends with great fishing, plus the knowledge that you will be in safe hands with a good captain, on good boats, in some of the prettiest and most productive waters in the world. Your trip to Florida doesn’t have to be spent fighting crowds, staring at high-rise condos, or fighting through amusement parks. Instead, let us help you develop a custom-tailored adventure package the entire family can enjoy! Join Captain Darrell Key for great fishing on the water. Low Key Charters offers flats fishing to near offshore. Try your hand at fishing for Trout, Redfish, Tarpon, Snapper, Grouper, Amberjack, the options are endless. Call today to book your charter and enjoy a great day of fishing on the Gulf! The charter boat Miss Mary and Capt. Chip Blackburn would like to welcome you to Mexico Beach and the great fishing area. A day of sport fishing aboard the charter boat Miss Mary can be a chance to do a little business, entertaining, or just a wonderful fishing trip with your family or friends. The waters of St. Joseph’s Bay and the Gulf of Mexico are both beautiful and bountiful for the visitors to our area. The charter boat Miss Mary is licensed by the State of Florida and the United States Coast Guard for a maximum of six passengers. She carries United States Coast Guard approved safety equipment and modern electronics. The Miss Mary has a private head and bunks as well as plenty of fishing room thanks to a very large and deep cockpit making it especially comfortable for women and children. The Miss Mary has a custom built elevated wheel house which we use primarily for cobia fishing in the spring and she has a large and deep cockpit. The boat was built for your sport, comfort and safety in mind. There is a good selection of fishing tackle with an emphasis on lighter tackle. The Miss Mary offers a variety of fishing choices for you to enjoy all year long. We offer excellent trolling, bottom fishing, or drift fishing both inshore and offshore. The trips vary in length from four to fifteen hours. We also offer shark fishing trips during the daytime as well as at night in the warmer months. Don’t miss the opportunity during your next visit to Mexico Beach to enjoy the great fishing we have to offer. Book your charter on Miss Mary today! Bottom fishing the reefs to trolling for pelagic species, we have the trip for you! We offer some of the best table fare the ocean has to offer. Snapper, Grouper, Cobia, Kingfish, Amberjack and many more! Providing a fast, quiet and comfortable ride to the fishing grounds for up to 6 passengers with fishing license and tackle included. Every guest of ours receives the highest level of customer service, professionalism, equipment and overall experience. Due to Hurricane Michael, the Mexico Beach Marian received major damage. However, repairs are already underway! Please continue to check back as updates will be made with regard to their expected open date. Due to Hurricane Michael, Beachwalk received major damage. However, they are already underway with the repairs! Please continue to check back as updates will be made with regard to their expected open date. Due to Hurricane Michael, The Driftwood Inn was destroyed, however the Wood family is dedicated to rebuilding and plans are underway! Please continue to check back as updates will be made as they are released. Nestled on the pristine white sands and aqua blue waters of the Gulf of Mexico Beach, the Driftwood Inn has a Victorian style with a Bed & Breakfast charm. Detailed amenities will make you feel like your home away from home. Come explore our gift shop. From antique souvenirs to t-shirts and postcards, we have something for everyone to remember their vacation in Mexico Beach. Enjoy your stay while relaxing in the gardens that overlook beautiful Mexico Beach. Pet friendly! Due to Hurricane Michael, Grove of Mexico Beach received major damage. However, the shop is already underway with the repairs! Please continue to check back as updates will be made with regard to their expected open date. Come browse and shop at Splendiferous MB located in The Markets at Mexico Beach! This retail shop offers it all….t-shirts, beach toys, fashion jewelry, candles, beach bags, home décor, apparel, footwear, and more! Look for the bright blue shop and enjoy a Splendiferous time shopping. Test your skills on the only Nicklaus Design golf course in Northwest Florida, or on the classic Meadows layout. A 36-hole resort facility. Recognized as one of the finest golf courses in the nation, Camp Creek delivers great golf in a beautiful setting to players of all abilities. This 18-hole executive golf course plays to a par of 60 and offers outstanding practice facilities. This golf club, located just south of Port St. Joe, boasts a 6,655 yard 18-hole championship layout with water in play on 14 holes, a driving range, putting green, pro shop and snack bar. Restore, revitalize & replenish your mind, body and spirit with some healing and strengthening yoga classes on the tranquil beaches of the Gulf of Mexico. Join our certified yoga instructor for Hatha Yoga and SUP classes, suitable for all levels. To learn more or for questions, please visit our website or give us a call. Horseback riding on the beach at Cape San Blas. You can ride morning, evening or sunset. All rides are by reservation only. Rides are out at Cape San Blas at Salina’s Park. Due to Hurricane Michael, the Buena Vista Motel was destroyed. The owners are exploring options and are hoping to rebuild! Please continue to check back as updates will be made as they are released. Come enjoy a stay at the beautiful Buena Vista Motel. Locally owned since 1975, our little seven room Inn is your perfect beach getaway destination. With a quaint design, and friendly staff, the Buena Vista overlooks the fabulous emerald waters of the Gulf of Mexico. You’ll be sinking your toes in the sand just steps away from your room’s door. Centrally located in the heart of Mexico Beach, you will be just minutes away from great conveniences including grocery stores, restaurants, shops and more! Call us today for good rates with amazing views. Due to Hurricane Michael, the Gulf View Motel was destroyed, however they are planning to rebuild! Please continue to check back as updates will be made as they are released. Imagine yourself in a great, affordable motel with a tremendous Gulf view, just across the street from the sandy beaches. Gulf View Motel is just that, a great little motel that boast amazing views of the beach and pristine waters of Mexico Beach, just a few steps away. Recently renovated rooms, some that offer kitchenettes. Make Gulf View you home away from home and let our friendly staff assist you for your much needed and long overdue vacation. Our agents have worked with hundreds of satisfied buyers and sellers. We offer an unmatched perspective and insight into buying and selling. There’s no other company along The Forgotten Coast that will provide you with a better buying or selling experience than 98 Real Estate Group. It is our commitment to put you first and give you the professional service that you deserve. We love the Emerald Coast and are passionate about what we do. If you have any questions about Real Estate opportunities in our area, please don’t hesitate to contact us! We look forward to hearing from you! Forgotten Coast Realty of NW Florida is a licensed Real Estate Broker in Florida, with our office located in Mexico Beach. Assisting buyers and sellers with their real estate needs. Genuine, diligent and professional, let us help you today. J.Cobb Realty is a licensed Real Estate Broker in Florida, with our office located in Mexico Beach. We specialize in the sale of beach and bay properties located in the Panhandle/Northwest Florida area. We also offer long term rentals in the area. Please call us today and let us help you find your next home. Over 30 years experience in the real estate sales, vacation rentals and development business has afforded us the opportunity to be aware of the intricacies of the Mexico Beach area. We can help you find the best deals on homes, town houses, condos and vacant land for sale. We specialize in gulf front, gulf view, canal front and beachfront properties. Our staff at Mexico Beach Harmon Realty knows almost all there is to know about the area. We live here, play here, worship here, work here, have raised our children here and plan to be around for years to come. Mexico Beach Sundance Realty is ready to help you begin your vacation rental plannings. Our seaside towns offers white sand beach, emerald green water gulf water, great saltwater fishing, breathtaking sunsets and mild North Florida climate. Our properties will captivate you and allow you to simply relax and unwind. With quaint small town charm and friendly laid-back attitude – no crowds, no worries, our beaches are the ones you will want to vacation on, year after year. Let our professional staff help you find a place you can truly relax and enjoy in. Welcome to Mexico Beach, Florida, where we’ve been a vacation rental leader sharing sunsets for over 65 years. We offer nearly 200 vacation rental homes and townhomes, from beachfront to specialty units with pools and boat docks. We hope you’ll let our family at Parker Realty help you make Mexico Beach your family’s vacation home. Visit us today for great specials and pet friendly accommodations. The stunning beaches along this amazing area of the gulf is known for its soft, sugar white sand and blue waters. This is your true escape from the chaos of urban life. Whether you are planning a family reunion getaway, an enchanting beach wedding, or last minute deals, we have it covered! For our animal lovers, we are happy to offer a selection of pet-friendly rentals because we know that your vacation just wouldn’t be the same without Fido in tow. Also, now available is our Beach Gear program which gives you access to some necessary goodies like chairs, umbrellas, carts or maybe for the more adventurous paddle boards, kayaks, beach cruisers! We are proud of excellent online rental reviews and we are sure this information will help you in your decision to trust Pristine Properties with your next vacation. “A taste of the islands” coffee shop offering a variety of coffees, espresso bar, gifts, gourmet foods, tea, pastries and more! Breakfast menu includes fresh ham and cheese croissants, sausage and cream rolls, a variety of muffins and our famous cinnamon rolls. Stop by and enjoy the coffee of the day or an espresso, cappuccino or a fruit smoothie. Best Pizza on the Beach! From simple cheese to gourmet creations, Crazy Beach Pizza has your style pizza. Also offering salads, hamburgers, hot and cold sandwiches and desserts! Come enjoy a slice, cold one and the beach views! Due to Hurricane Michael, Killer Seafood was destroyed. However, the Killer Gang is coming back and working on a new hangout as we speak! Please continue to check back as updates will be made with regard to their expected open date. The “Killer” Gang invite you to enjoy the best meal you’ll ever have. Killer Seafood, a Coastal Living Best Seafood Dive (2012, 2013, 2017) offers only the freshest seafood around. Try the famous fish tacos, savor the smells and aroma of the bread bowls, indulge in the ‘killer’ key lime pie and wash it all down with a cold one. Open Tuesday – Sunday for lunch and dinner, this is one place you will stop at again, and again. For those that love the simmering sauce, you are in luck, we sell it so stop by and grab a jar, or 3, on your way home. They make amazing gifts. Due to Hurricane Michael, Sharon’s Cafe was destroyed. However, Sharon and her gang are rebuilding and a new building plan is underway! Please continue to check back as updates will be made with regard to their expected open date. Due to Hurricane Michael, Shoobies was destroyed. However, they are working on plans to open new doors as we speak! Please continue to check back as updates will be made with regard to their expected open date. Due to Hurricane Michael, The El Governor RV Park received major damage. However, the RV Park is already underway with the repairs! Please continue to check back as updates will be made with regard to their expected open date. Located just across the street from the beachfront motel, the campground features spacious camper sites in a shady Florida setting. You’ll enjoy the beach and the magnificent sunsets. We are a full service RV community with showers, picnic tables, beach access and laundry facilities. Call today to reserve your spot and begin to enjoy all we have to offer. Offering a full-service campground that invokes relaxation. A short, half mile walk to the beautiful beach, Rustic Sands sits on 20 acres of pines. Amenities include heated pool, wifi, recreation hall, and lots more. This storage facility offers household and commercial storage units along with boat, RV and camper storage. This self-storage facility offers storage units that are available to rent for household and commercial storage. Come rest and relax in our beautiful retreats all located in sunny Mexico Beach! A place where you can get lost in the sea and sun. Where the place of life sways and strolls, where there are no traffic lights and the sand on the beach glistens white like snow, and the gulf is warm and crystal clear. With a nice selection of homes to select from, you will be able to find the ideal vacation getaway that you’ve been longing for. Come take a closer look at all our featured properties and let Clements Family Vacation Rentals host you in a vacation retreat right in the heart of Mexico Beach. This is the place to spend your next vacation and we are here to help make that happen. With a full range of properties to choose from, we have something for everyone. From beach front to canal front, we can help you find your ideal vacation home. From vacation properties to long term rentals, the team at Forgotten Coast Property Management can find the perfect location for your stay. We offer outstanding service, premier properties and customer satisfaction. We’re glad you’re here to visit and we hope you’ll stay with us. We offer the best selection of over 150 rental properties on the Gulf Coast! From new five-bedroom beach estates to affordable condos, we specialize in finding the unique home to meet your needs. Whether you desire pet friendly, pool units, wireless internet, or town homes with a private dock for your boat, we have the right home for you. Visit our area information page to learn more about the beautiful areas we serve and explore the properties we have available. Personal agents are on hand to help you with your needs, questions and finding the ideal home for your vacation needs. Harmon Realty Vacation Rentals is pleased to present an extensive selection of prime vacation rental properties along the gulf coast. Offering luxury homes, townhouses and condominiums with the best amenities- beachfront, gulf view, pool, elevator, complimentary WiFi, and much more. All our properties have easy access to the Gulf of Mexico and miles of sandy white beaches. Our goal is to offer true southern hospitality to all our visitors. Let our friendly staff help make your vacation an enjoyable and memorable one. The beaches of Mexico Beach offer a glimpse into what a Florida beach vacation might have been decades ago. Offering rentals with doors that open up to the sun and sand. Come stay with us and have “No Worries” while on your beach vacation. Our name says it all! Serenity Beach Rentals, LLC offers coastal vacation rental homes along the beautiful beaches of Cape San Blas, St. Joe Beach and Mexico Beach. Nestled in the panhandle of Florida, our small community boasts miles and miles of white sand beaches. Your most prized memories are here waiting to be made. Whether it’s hours of quiet solitude or activities in the great outdoors that you crave, we have a little something for everyone. Our beaches are a place where everyday feels like the weekend. Ready for an easy, stress-free family vacation? Vacasa is ready for you! At Vacasa, we’re more than just a website! We help families and friends enjoy time together in our privately owned vacation homes. Discover the Vacasa difference! Welcome to paradise. Walton Sands features properties in the heart of Mexico Beach, providing luxury, hospitality and relaxation at an affordable price. Our friendly staff can customize your dream beach vacation, meeting all your desires. With a nice selection of units to select from, we are sure we will have what you are searching for. Call us or book online, today! Your next vacation awaits with Walton Sands. This 3 bedroom/2 bathroom home is a quick walk to the white sands and emerald waters of the beach and can sleep up to 8 people comfortably. All Decked Out offers a spacious living area, sun porch and recently updated, fully stocked kitchen. After a fun day on the beach, wash off at the outdoor shower and relax inside with an assortment of indoor entertainment including a 40″ LED television or play in the shaded backyard. Ready to grill out your day’s catch? The perfect place is the screened in cookhouse with all the amenities to clean and cook it up. Sunrises and sunsets are amazing in Mexico Beach and don’t forget to enjoy watching them on the 300 square foot rooftop deck. Gulf Views-Pet Friendly! Beach Shack located at Summerhouse is the ideal vacation home for those long weekends, summer weeks or simply anytime you need to retreat to the beach. If you are looking for a relaxing peaceful vacation this is the spot for you! Complex has a heated pool, hot tub and Sauna for your enjoyment. This is a first floor unit with water views, accommodates six, offers a large covered balcony, and only steps to the beach. Free covered parking under the building and carts to haul in your luggage or groceries. With two beds and two bath, plus a fully equipped kitchen, this is you beach home away from home. This beautiful 3 bedroom/2 bath condo is located directly across the street from the Gulf where you can listen to the ocean waves from your balcony! Best Day offers direct beach access and will give you a Best Day, Best Week vacation! Featuring a master suite with a king bed, sunken tub and walk-in shower, a queen bed in the second bedroom with en suite bathroom, and two twin beds in the third bedroom. The kitchen is fully stocked if you wish to cook your catch of the day or dine at one of the nearby restaurants. Kick back and enjoy the game or your favorite show on television with satellite/cable/dvd. Create memories to last a lifetime with family and/or friends at this luxury condo! Beautiful 2/2 condo in the most desirable condo in Mexico Beach is new to the rental market. Waterside Village is one block from Mexico Beach’s sugar-sand beaches. Perfect for a relaxing couples getaway or a family vacation you will long remember. High quality mattresses and bedding, flat screen TV’s, a video library, local artwork, Corian kitchen and bathroom countertops, cook’s kitchen stocked with spices, quality cookware, waffle maker, juicer and more Large pool, hot tub, barbecue grills, on city bike path and one half mile from the city boat ramp. One block to city fishing pier and restaurants. Condo overlooks canal and condo boat docks. Paradise in Style and close to everything you need to enjoy the best of the beach! Forget about driving — popular Toucan’s Restaurant is across the street and both Killer Seafood and Gulf Foods Grocery are half a block away. The large pool and hot tub area is just outside your doorstep with your own private entrance allowing you to have coffee or lunch on the pool deck. There is a great ocean view everywhere you turn and of course, the dedicated beach is footsteps away. This beautifully decorated 3 bedroom/3 bath condo boasts high quality furnishings that will make you say WOW from the moment you open the door. Beautifully furnished with a large, high-end kitchen with granite countertops and quality furniture. Master bedroom opens out to a large private balcony and the master bath features a large tile shower, double granite vanity top and spa tub, private parking makes your visit easy and comfortable from start to finish. This is truly Paradise in Style! Enjoy sweeping views of the Gulf of Mexico at Sea View! This 2 bedroom/2 bathroom condo is a short three minute walk to the beach. The master bedroom has a queen bed and large en suite bathroom and the second bedroom has 2 sets of bunk beds which sleeps 4 comfortably. Lay out by the large pool offering plenty of chairs and tables or take a dip in the hot tub. Relax and watch television with the satellite/cable and video library provided. Quality dishes, pots and pans, waffle maker, griddle and more are provided to make your vacation stress-free. Ready to grill out? Three grills are provided by the pool so you can grill out while the kids play in the pool! Hitting the beach? Don’t forget the provided wagon for your beach toys! Stay at this newly furnished condo with a ‘beachy’ atmosphere and wonderful view of the Gulf! This spacious 2 bedroom/2 bath condo (sleeps 6) is located on the 3rd floor with easy access to the beautiful white, sandy beaches of Mexico Beach. Watch the amazing sunset from the large pool, sauna or hot tub and afterward enjoy a delicious meal of fresh seafood at one of our local restaurants or purchase fresh seafood at the local market and prepare your own recipe in the fully equipped kitchen. Come kick back and relax at Summerhouse #302! This gorgeous unit features two master suites, Gulf Views, Canal Views, double balconies, and so much more – that’s why we call it “Two Sisters in Paradise.” Perfect for families who need room to spread out and want all of the amenities like a gated community with postcard views of the water, waterfall hot tub and waterfall pool, community grilling area, etc. Located on the second floor, you have easy access to the parking area and beach, while you get the privacy of the end unit that looks straight at the Gulf of Mexico! Yes, you can bring your boat. Yes, we have a fully stocked unit filled with luxury amenities, and yes, that is the Gulf of Mexico right outside your doorstep.